These are the electric fireplace media consoles buyers have fallen in love with. Welcome to our summary post featuring 5 electric fireplace media console reviews. We are giving you a snapshot of 5 great electric fireplace TV centers. Links to comprehensive reviews on each are posted at the end of each fireplace listed. People love the fact Electric fireplace TV consoles serve several purposes. They are attractive furniture on their own and can serve as a room a focal point. Electric fireplaces generate the warm cozy atmosphere most people are looking for, as well as providing organization and storage for electrical gaming components.consoles and are great if you are challenged for space, need a little heat and want something fun to look at. Let the style be your initial guide. What are you attracted to that will fit your rooms decor? Remember ALL of these units perform well. First, we looked at overall actual buyers satisfaction and the reviews. Were they RAVING fans? We looked at the organizing capability and storage capacity. We made sure the fireplace flame effect and heating were ‘good’ or even better. Helpful Hint: Make sure you have an accurate idea of their size. Will they fit in your space? Take some Scotch tape or pins, string, and a measuring tape and transfer the dimensions to your wall to form an outline. This will give you a realistic idea of the size of the unit. Many images can make them appear larger or smaller than they really are. We hope you have an enjoyable browse that will point you in the right direction to purchase an electric fireplace media console that will fully meet your needs and your budget. This electric fireplace TV center is beautifully proportion with lots of space for electronics. In truth, this is our favorite. It is also available in your choice of 3 finishes seen below. Did you know: That some people mount the flat screen on the wall. Here, you can put a flat screen TV directly on the mantel top. It is capable of safely supporting a television of 100 lbs..
You can put roughly a 50″ TV on the center section and have just a little overhang over the side pieces. This is roughly the size of the TV in the image at the top of the post. That center section is rated to support up to 100 lbs. You can put a TV of up to 70″ on top put would lose storage on top of the wings. Another idea is to mount your TV on the wall. The overall dimensions of this fireplace and media unit are 30.5 inches high by 18 inches deep by 67 inches in width. It weighs 143.5 pounds. The center shelf is 27 inches wide and 12.5 inches deep and the side cabinets are 13.5 inches wide and 12 inches deep. It can support a weight of up to 100 pounds.Assembly is required and the unit is supplied with assembly instructions, remote control and user manual. The vast majority of buyers enjoyed the flame affects of this fireplace. They believe that the realism was very good, some buyers said that it was the main reason they purchased the unit. What’s the point of having an electric fireplace if it does not generate the mood and ambience you’re looking for? There were many positive comments on the appearance of the fireplace, it was described as being very beautiful and looking awesome. Many people believe that the fireplace was very sturdy and solidly built. The majority view was that the fireplace could be put together easily. Most people were able to assemble it in about one hour once they got started. The instructions are clear and easy to follow. Most people will be able to put everything together without a problem – if you can put together an IKEA bookshelf you can handle this. If you like the styling – go for it. There were several customer reviews for this fireplace and the ratings given were 62% for 5 out of 5 stars and 21% for 4 out of 5 stars. The total is 83%in the very good to excellent range, which is a good overall rating. The majority of the comments made by customers were positive about the Real Flame 7720E Calie Entertainment Unit With Electric Fireplace. This fireplace is well made and provides the convenience of a media unit combined with an electric fireplace that will heat your room and provides good ambience. The fire effects are realistic and the design of the unit is really stylish. We recommend this fireplace. This electric fireplace TV console is made by Southern Enterprises who made their mark in furniture design – this carries through on the quality construction and attractive design proportions. It has both open and closed shelving with lots of space for electronics. In truth, this is our favorite. It is also available in your choice of the 2 finishes seen below, Espresso and the lighter, Glazed Pine. Spoiler Alert: We really like this manufacturer. The firebox (flame effect & heater) is quite nice and, in fact, has become a standard and is used in a number of their models. If you like the fashionable look, this may be the one for you. The mantel can safely support a television of 85 lbs. There were more comments about the looks of the fireplace than anything else. It was described as “beautiful”, “gorgeous”, “classy”, “elegant” and so on. Buyers were also impressed with quality. We are fans of SEI fireplaces because of their furniture quality. One customer described it as a “wonderful piece of furniture” and several thought that it was a strong unit that would support a range of media products. They also really liked the overall value the unit presents. The price of the unit was commented on quite a lot. A lot of people felt that this fireplace offered very good value for money with features that could only be found in units that cost a lot more. There is some assembly required. A lot of customers stated that they thought that the assembly of the unit was very easy. The usefulness of the assembly instructions was mentioned and a number of customers felt that the fireplace was easy to put together with just a screwdriver and some wood glue. Accommodates a flat panel TV up to 46″ W overall and 85lbs. The Narita Media Electric Fireplace is 48 inches wide by 32.5 inches in height and 16.25 inches deep. The unit only weighs around 34.1 pounds. A flat screen TV of up to 50 inches in width can be supported by the mantel which has a weight bearing capacity of 85 pounds. A remote control is supplied as is a manual for assembly. The color of the unit is Espresso (darker) or Pine Oak (lighter). Make your choice when ordering. Links for both can be found at the beginning of the post.Assembly is required and the unit is supplied with assembly instructions, remote control and user manual. Customers were very satisfied with 2 key points – flame effects and the heater. There were comments about how realistic the flame effects were as well and the overall ambience that the unit provides. The efficiency of the heater was mentioned by a lot of customers and there were comments about how well it heated rooms and how quiet the fan assisted heater was. If you like the styling – this will be a winner for you. There were a large number of reviews left for the Narita Media Electric Fireplace Entertainment Center. From the customers that left a review, 64% of them awarded a 5 out of 5 star rating, and a further 21% awarded a 4 out of 5 star rating. This gives a combined total of 85% for this model which is good. This fireplace is stylish and provides excellent features for media storage. It is good value for money and the flame effects are pretty realistic. The heater does a good job in heating rooms efficiently and overall we would recommend this unit. We recommend this fireplace. This Is The Most Economical Of All! : This fireplace is designed to accommodate a flat screen TV of up to 70 inches in width, and the maximum weight that the TV shelf can support is 135 pounds. 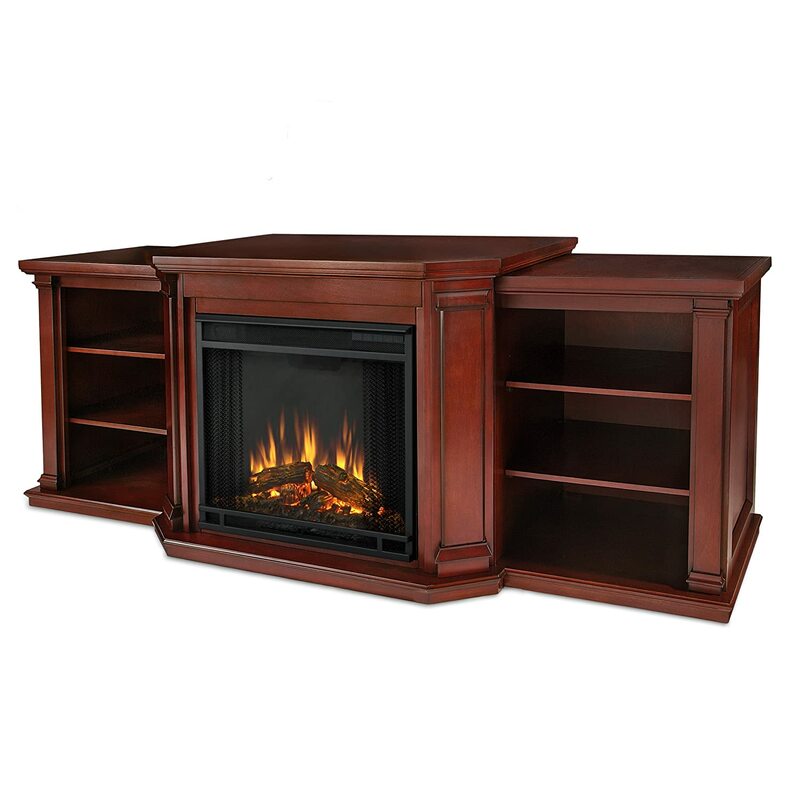 This electric fireplace TV stand is extremely popular, possibly the best selling TV stand/fireplace combo out there. The TV stand is robust and will handle a large TV easily. This fireplace is a recommended purchase for the budget minded and those who are not looking for bells and whistles on their electric fireplace. This fireplace is designed to accommodate a flat screen TV of up to 70 inches in width, and the maximum weight that the TV shelf can support is 135 pounds. There is also an insert which is 18 inches wide. This unit consists of the firebox in the center, two storage cupboards on either side with doors, and a TV stand mounted on the top of the unit. The dimensions of the unit are 63.1 inches wide by 18 inches deep by 26 inches high. The unit weighs in at 113.4 pounds. The shipping weight is 194 pounds. The unit will need to be assembled and full instructions are provided. A remote control is also supplied. In all honesty we are a little conflicted. The purist electric fireplace lover, who is looking for versatility in the ambiance created by the flame effects may be a little disappointed. Those looking primarily for a nice inexpensive TV stand as furniture and wanting something extra (the fireplace) will be very pleased. Taking all of the large number of customer reviews into account, 57% of the reviewers gave a 5 out of 5 star review and 24% awarded a 4 star review. This is a respectable 81% for a 4 or 5 star rating and is pretty good for the fireplace market. This is an attractive fireplace and TV unit combined that has an electric fireplace heater as a bonus rather than a feature. This electric fireplace TV console is another by Southern Enterprises. It features louvered cabinet doors for extra storage. This electric fireplace heater is the only selection featuring a quartz infrared heater – which means it will heat up to 1,000 square feet as apposed to the industry standard of 400 square feet. The flame effects are very good. The 2 finishes – Antique White and Black/Walnut are shown below. Did you know: That different finishes are often different prices for the same fireplace?. Here, you can put a flat screen TV directly on the mantel top. It is capable of safely supporting a television of 100 lbs.. Many thought that the price of this fireplace was very good considering that it is a media console as well and it being good value for money when compared to other electric fireplaces. There were quite a few comments on the positive side about the infrared quartz heater and its enhanced heating capability. It was able to heat rooms efficiently and quickly. Some said that their rooms were “warm and toasty” in no time with this heater. Most customers liked the capacity of the unit for storage and the fact the shelf runs the width of the unit. Also a plus – being able to handle a large TV. There is lot of room for media accessories and everything can be well organized in the side storage compartments. There were several customer reviews for this fireplace and the ratings given were 66% for 5 out of 5 stars and 27% for 4 out of 5 stars. The total is 93% in the very good to excellent range, which is a good overall rating. This fireplace is well made and provides the convenience of a media unit combined with an electric fireplace that will heat your room and provides good ambience. The fire effects are realistic and the design of the unit is really stylish. The Antebellum Media Electric Fireplace really looks the part and provides good media storage functionality. The heat output is good and it will provide a very nice centerpiece for any room. This is certainly a recommended purchase.We recommend this fireplace. This is a corner electric fireplace TV console; it dies not have to take up an entire wall. It features angled cabinet doors for extra storage. The flame effects are very good. There are 4 finishes – Brown mahogany, Black, Ivory and Cherry shown below. The different finishes will have different prices so click through to see the current discounts. Did you know? Corner electric fireplaces are real space savers – but they do not have to be placed in a corner. They stand nicely on their own against a flat wall – see the example of the Ivory fireplace image below. There were many customers that liked the look of the fireplace and some people commented that guests to their homes were very complimentary about it. The unit has been described as “beautiful”, “gorgeous” and “lovely”. Many people said that the fireplace looked just as it was pictured. One the the primary things we look for in an electric fireplace is good to great flame effects. In general, people really liked the flame effects of this fireplace. The realism was commentated on a lot and some customers said that they were very pleasantly surprised by how real the flames looked. Quite a few buyers were very happy with the heat output of the fireplace. Many said that the heater made their rooms warm pretty quickly and the thermostat feature was popular with a number of customers. “It heats our room fine” was a very common comment. This electric fireplace media console has a unique collapsible panel which will allow you to place the unit against a flat wall or a corner (hence the ‘convertible’). The unit will accommodate a TV of up to 46 inches in width and it can support up to 85 pounds in weight. If you install the fireplace against a flat wall then the dimensions will be 48 inches wide by 15.75 inches deep and 32.25 inches in height. If it is located in a corner then the dimensions will be 48 inches wide by 27 inches deep and 32.25 inches in height. The fireplace will require assembly and full instructions are provided as well as a remote control (batteries not supplied, man I hate that). Looking at the total number of buyer reviews, 69% flat out awarded the fireplace 5 out of five stars with a further 20% awarding a four out of five star rating. This is a very good combined total of 89% for a 4 to 5 star review, which is outstanding. This is a very good looking electric fireplace heater and media TV stand combination which has the flexibility to be located against a flat wall or in a corner. The flame effects are very nice and realistic and the heater is very efficient. This fireplace would make a great addition to any room. Very strongly recommended. This is certainly a recommended purchase. Welcome to our comprehensive review of an electric fireplace entertainment center, the Valmont 7930E-DM. 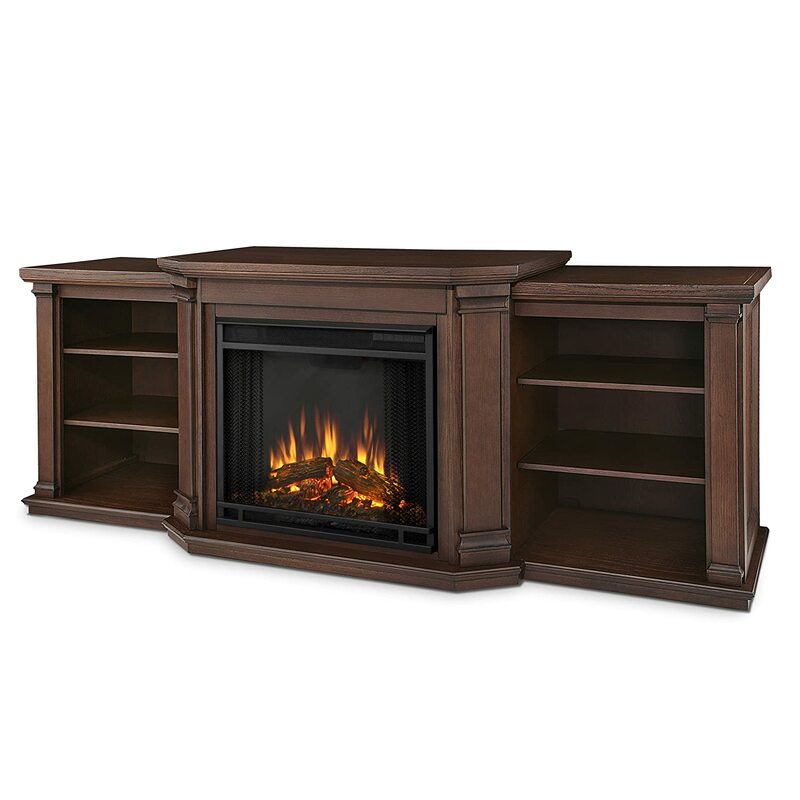 Spoiler Alert: This electric fireplace media center is available in two finishes: Dark Mahogany and Chestnut Oak. This fireplace is designed to be a room focal point and is very attractive.If you like the fashionable look, this may be the one for you. In this Real Flame Valmont Entertainment Center Electric Fireplace review you will discover the benefits and features of this media fireplace. Our intent with the review is to ensure that you have all of the necessary information that you will need to make an informed purchasing decision. Pros and cons of the unit are also included and these are summaries from real reviews left by customers. If you are looking for a well designed and stylish electric fireplace and media unit combined then the Real Flame Valmont is a good choice. It has a realistic flame effect firebox that will provide good ambience for your home or office as well as supplemental heat. This free standing electric fireplace heater accommodates a flat panel TV. The mantel can support up to 100 lbs, sturdier than most. The middle section is about 37″, each of the side panels are around 18″. If your TV is really wide, you can mount it on the wall above the unit. The mantel can support up to 100 lbs, sturdier than most. The Real Flame Valmont offers realistic looking flames and burning embers which can be switched on without the need to run the heater function at the same time. There is an ambient light above the burning logs which adds to the overall effect. Everything is powered by the VividFlame LED technology and the LED’s will not require replacement. The firebox has a dynamic embers function which will allow dimming or brightening of the embers for a more realistic look. The flame brightness can also be adjusted to five different levels and the ambient light above the logs can be turned on or off. The glass at the front of the fireplace should never get hot so it is safe for young kids. This particular fireplace is going for the realistic flame effect of a real fire. There are no fancy colors or light shows. The flames operate independently of the heater. There is no need for the heater to be operational at the same time as the flame effects. Being an electric fireplace there is no combustion taking place which means that there are no smoke or harmful pollutants and emissions. The heater can provide an output of 4700 BTU’s at 1400 watts. There is a programmable thermostat with this heater so you will be able to set the desired room temperature and the heater will switch off once this is achieved. The heater is fan assisted and designed to provide supplemental heat for most rooms. The heater plugs in to a standard 120 volt 60 Hz electrical outlet. Customers stated that the heater could heat up a 600 square feet room efficiently. The fan is fairly quiet in its operation. We believe it is very important that everyone purchasing an electric fireplace heater be aware of the limitations of these units. With very rare exceptions and this electric fireplace heater is no exception, an electric fireplace heater is best thought of as a supplemental heat source. Or part of a comprehensive zone heating plan. Quite simply they will not heat your whole house. The limiting factor is the ability of standard household plugs and circuits; not the electric fireplace. Generating more heat requires more electricity than the plug and circuit can handle. There is a control panel which is located at the top right of the firebox and there is also a remote control supplied which will provide full functionality. In order to activate the remote control the power must first be turned on manually using the control panel. There is a power on and off switch and when this is used the previous heat setting will be automatically recalled. The brightness of the flames can be adjusted and so can the burning embers. There is a temperature adjustment control where the room temperature can be set. This can be set to zero if only the flame effects are required. A timer is included to shut off the heat and this can be set from 10 minutes to 9 hours. The Real Flame Valmont is a large media unit and measures 75.5 inches in width by 27.7 inches in height by 21.5 inches in depth. The unit weighs 150.5 pounds. The mantel can hold virtually any size of flat screen TV and will support 100 pounds in weight. Full assembly instructions are provided as well as a fully functional remote control. A lot of those that had purchased the unit were very pleased by the way it looked. A lot of people said that the fireplace was “beautiful” and one customer stated that the unit provided a huge compliment to the decor of the room it was installed in. Also, a few people commented on the flame effects and felt that they looked good overall. The adjustment capabilities of both the flames and the burning embers were appreciated by the customers. The available space for media storage was appreciated by most customers. Also the sturdiness of the mantel and the fact that it was able to support TV’s up to 100 pounds in weight was also appreciated. There were quite a few positive comments about how easy it was to assemble the fireplace. Assembly times quoted varied from one to two hours. The detailed instructions were complimented and most people were able to put the unit together themselves without any outside assistance. There were a few comments about the overall quality of the unit. It was felt in general that the pieces were well made and that they were strong and robust which is different to a number of other self assembly fireplaces on the market. A number of buyers felt that the fireplace represented good value for money. One said that it was “worth every penny” and there were other comments about the high quality of the unit for the reasonable price tag. We looked very carefully for negative reviews and ‘cons’ in terms of fireplace function and design and found hardly any, really. The negative comments and down grades from 4 or 5 stars appear to be one of a kind issues. One customer was unhappy with their fireplace as they found that the shelf supports broke and other things went wrong. This is far from the majority view and we believe that this customer was just unlucky with the unit that they received and that this would have been changed under the warranty. A single purchaser had real problems getting all of the pieces to fit together claiming that holes were drilled incorrectly and that some parts were wrongly manufactured. Again this was not the view of most of the customers who felt that the unit was easy to put together. This unit should have been returned for a new one. Of those people that purchased the Real Flame Valmont Media Fireplace and left a review, 74% of them gave the product a 5 out of 5 star rating. Another 9% awarded the fireplace a 4 out of 5 star rating which gives a credible combined total of 83%. This is a quality fireplace that has ample storage facility for all of your home entertainment media. The mantel is strong supporting the largest flat screen TV’s. The flame effects are good and the heater will take the chill off of most rooms. This fireplace is a recommended purchase.